Apologies for the terrible photo here! 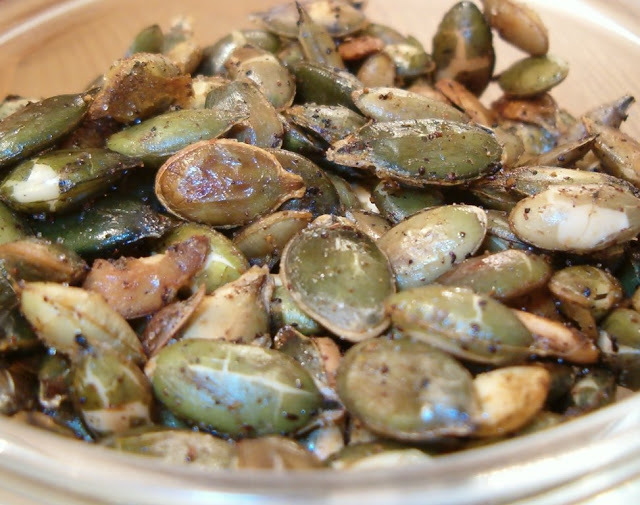 These are one of our favourite snacks, great with beer or just on their own, and don't forget how insanely good for you pumpkin seeds are! As for the chilli powder I use a seasoned mix here, something like a fajita or taco seasoning mix would do. Simply toss all together until well coated. Place in a hot dry non stick frying pan and heat until the start to pop and lightly brown. You can also do these in the oven, about 200C until again, the pop up and are golden. Let cool slightly as they will be lethally hot at first!